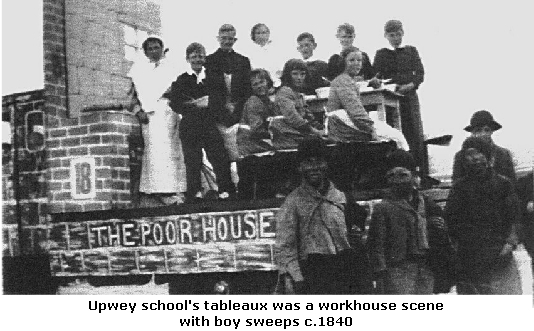 Compiled from the Upwey & Broadwey History Collection this includes extracts from the school log books which were completed by the head teachers' and pupils' memories. 1917 - May - Medals for Good Attendance at Day School. Reginald Adams; Elsie Board; Gertie Broomfield; William Barnes; Elsie Churchill; Elsie Clements; Norah Davey; Reginald Dominey; Hilda Foot; Leslie Foot; Kathleen Hawker; Rose Hawker; Ethel Lees; Mary Pearce; Iris Strange; Harry Tidby; Cyril Weisham; May Willis. 1918 - 9 Oct to 18 Nov. School closed for 4 weeks due to influenza epidemic. 1918 - 18 Nov. Attendance 92 and 96. The epidemic seems to have subsided and only two or three families appear now to be affected. 1920 - 23 June. Only 77 present this afternoon. This was owing to a fete in the village and also a wedding at one of the chapels. 1920 - 19 July. A circus in Weymouth has made a difference to the attendance today. 1922 - 9 Jan - 19 Feb . School closed due to whooping cough epidemic. 1922- 23 Mar. Poor attendance this afternoon - some of the older children have gone to the races at Broadwey. 1923 - 26 April. Holiday for the Duke of York's wedding. 1923 - 13 July. The heat has been dreadful this week, sometimes reaching 80o - despite watering the floor and having all doors and windows open. 1923 - 20 July. Holiday this afternoon on account of the visit of Prince of Wales to the Wishing Well. The children all lined up and sang 'God Bless the Prince of Wales'. 1923 - 6 Dec. School used as polling station. 1924 - Oct. School used as polling station. The South Dorset and Cattistock Hunt met at the Wishing Well four times during the winter. At 11am the older children were let out of school to follow the hounds, they had to be back by 1.30pm. 1925 - 1 Sept. Miss Edith Lunn commenced in Infant Room replacing Miss Nix who left at the end of last term. 1926 - June. Circus in Weymouth affected attendance. 1926 - Oct. A case of diphtheria in the village so Dr Pridham visited school to check children. 1927 - 1 July. During this week children aged 13 yrs plus have taken three papers set by County School Examinations - Arithmetic, English A and B. 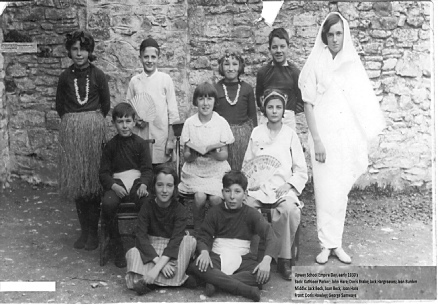 1927 - 5 Sept. Miss Sarah Rogers commenced as head teacher. 1927 - Sept/Oct. Four times during the autumn, Rev Bolden from Elwell Lea sent a large hamper of apples for distribution amongst the children. 1927 - 24 Oct. Photographer visited the school to take class pictures. Mr Stephen Rogers, market gardener, used to give a Christmas tree to the school. Val Pearce often helped to put the pinch candles on the tree. One of Edie Cave's (nee Didcot) memories was of being the first member of her family to be caned - for sewing herself to a classmate. The teacher found out when one of them was called to the front of the class and they both had to go up. 1928 - 2 March. Classroom used in evening for a smoking concert with refreshments. 1928 - 18-29 June. School closed owing to measles. 1929 - 27 May. Rehearsals for Empire Day Pageant, in which all Class 1 and a few from Class 2 took part. At 3pm on Empire Day celebrations were held. Each child received a small flag to wear upon leaving. 1930 - 1 May. School holiday owing to a girl guide rally at Dorchester attended by HRH Princess Mary. 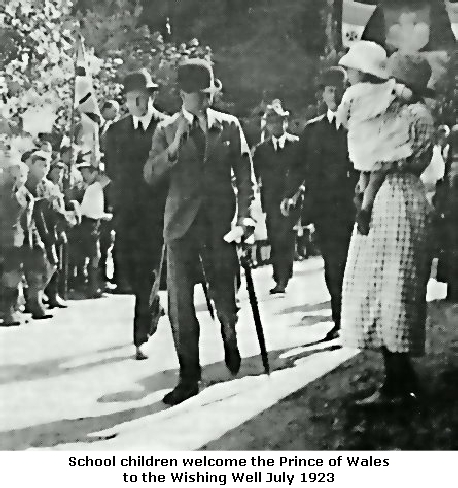 There was great excitement and anticipation in the weeks running up to Thursday 1 May 1930, when Princess Mary attended a rally at Kingston Maurward Park. The weather was glorious and the Princess looked very smart in the uniform of the President of the Girl Guides Movement. At 2.30pm the Princess walked to the saluting base through a guard of honour. The march past of more than 3,000 guides lasted for more than 25 minutes and was a wonderful sight. Among the standard bearers who presented a flag to the Princess were Edith Didcot, Edith Pearce and Christine Davage from the Upwey troop. 1930 - 18 July. Folk Dancing display at Bovington Camp - 16 girls and Miss Rogers attended. 1933 - 65 on role. Mrs G Dowding head teacher. Teachers: Mrs Dowden, Miss Rogers , Miss Lunn, Miss Barbara Baker, and Mrs Edwards, temporary Supply Teacher. 1933 - 31 May. The boys of Class 2 were taken to the top of Windsbatch Hill for an English dramatisation of a history story and drawing the view of Friar Waddon and the Wishing Well. The school often used Windsbatch for dramatic work. 1933 - 2 June. 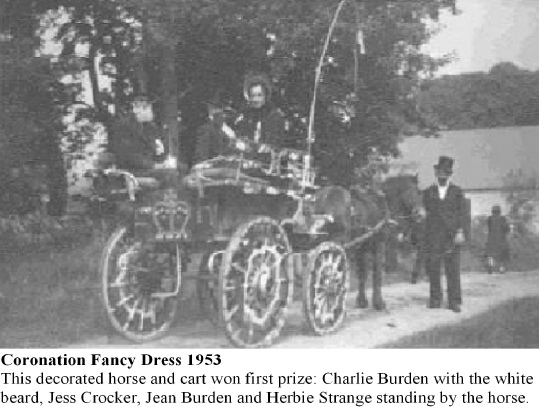 Prizes for Empire Day awarded to: May and June Beck; Jack Burden and Donald Gooch. 1933 - 15 June. Miss Rogers took 16 girls to Folk Dance Festival at Bovington in the afternoon. 1933 - 8 July. The first Beating the Bounds following the boundary changes - Jean Burden; Doris Howley; Vic Ayles and Fred Carter took part. 1933 - 5 September. 60 on roll. School affiliated to the School Athletic Association. 1933 - Autumn. Rev Bolden (lived at Elwell Lea) sent 2 large hampers of apples to be shared amongst the children. 1934 - 9 May. In the afternoon there was a 6-a-side Tournament in Weymouth: Upwey & Broadwey fielded teams including 6 boys in the Junior and Senior Sections from Upwey. 1934 - 14 September. 25 senior children went to Maiden Castle to see the excavations. 1934 - 1 October. Children visited the League of Nations meeting at Alexandra Gardens. 1934 - Oct. Children given Horlicks Malted Milk . 1934 - November. Annual prize giving. 1935 Cookery and woodwork (Mr Cook) classes were held at Reynolds Institute. 1935 -1 Feb. Children went to see a film on India at the Sidney Hall. 1935 - 6 May. King George V - Silver Jubilee. Children of Class 1 and 2 were taken to see the Civic Ceremony at Westham, where Jubilee Spoons were presented to every child by the Mayor. In the village just under £19 had been donated by local residents to enable the occasion to be celebrated. 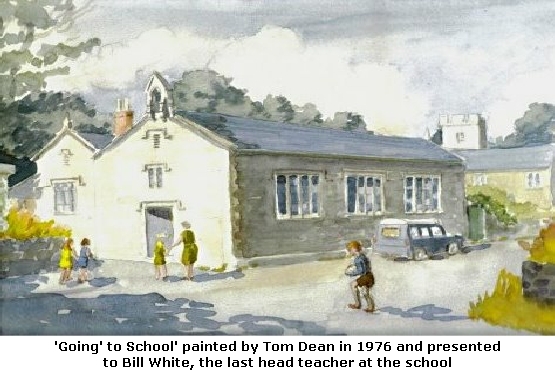 The fund enabled: tea to be provided for 150 children and 80 parents in the WI Hut; for 200 children to receive a Silver Jubilee mug; and for all villagers over the age of 70, who were drawing the old age pension, to receive a hundredweight of coal. Mr O W Baker hosted Sports Events in his field off Chapel Lane. Starting in the early afternoon they continued until late evening. At 2.15pm the children gathered on the green at the bottom of Stottingway Street and, led by the wireless van of Dawes of Dorchester and village worthies, they marched to the field. As the children left the field at the end of the day they were presented with oranges and sweets by Mrs P Lovell. Schools in the Borough were closed for 4 days to allow the children to take part in the celebrations. 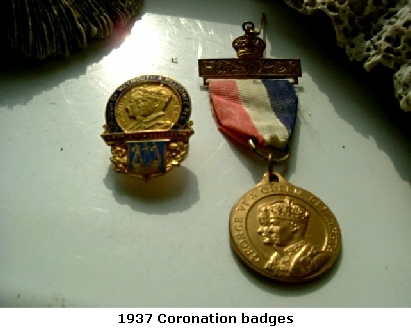 The Weymouth Education Authority organised the distribution of enamelled and gilt badges for every schoolchild of the borough at a cost of £110. The Weymouth Education Authority organised a Schools' Pageant of 'England Through The Ages'. Every school in the Borough took part in a procession staged between St John's church and the King's Statue in Weymouth. Children not involved with the tableaux entertained the crowds with morris dancing. A sports day and tea was organised for all schools at various venues around the town. 277 children from Upwey, Broadwey and Radipole came together at Broadwey Rectory Field on the afternoon of Thursday 13 May. Councillors P Lovell and H Medlam helped Rev E Walder (Broadwey) and Rev A Bryant (Upwey) with the smooth running of the various events. The Mayor (Councillor Bert Biles) spoke to the children at the start of the afternoon, using amplifying apparatus which Messrs Bennett and Escott had provided to assist with announcing events. At the end of the afternoon, tea was served by the teachers. 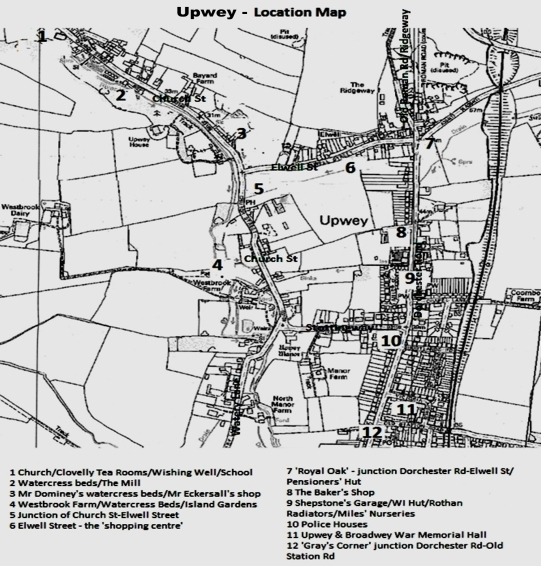 As there was no building large enough to accommodate all the children together; Radipole returned by bus to their school; Broadwey returned to their school and the Upwey children had tea in the Temperance Hall on Broadwey Hill.